Gros Morne National Park in Newfoundland, Canada has many spectacular sunsets but this one has almost diminished as the last rays of the sun shine across the harbour over Rocky Harbour Marina in Newfoundland, Canada. People stand on the dock of the marina sharing stories before the sun disappears for the evening and darkness settles in. 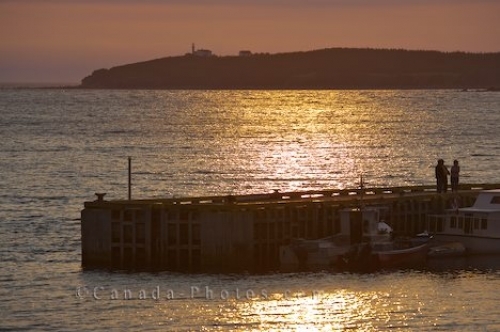 Picture of Rocky Harbour Marina at sunset with Lobster Cove Lighthouse perched upon the cliff in the background in Newfoundland.